The 2007 Jeep travelbug arrived in the post last night. Looks really neat. I have plans to go out to a special cache on Friday with Team JnLe4 and looking forward to getting some good “action” photos before I leave it in the cache. 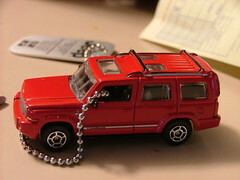 This year the jeep travelbugs are red and you can sign up to receive one to put out in your nearby cache. I’ve requested one so will hopefully get one. It seemed to work ok with the diabetes travel bugs and this way also means that I will get to see at least one Jeep – I never got to log the first yellow jeeps but did manage to get a couple of the white ones when they came out – they were bigger than I was expecting. If you have firefox and greasemonkey installed (and if not why not?) then check out the greasemonkey scripts at Locusprime that enhance some of the website pages. There are some really nice enhancements here – I’ll leave you to go search the site and start enhancing your cache viewing.